We're still in the dark on if/when "Doctor Who: Evacuation Earth" for the Nintendo DS and "Doctor Who: Return to Earth" for the Wii will see a stateside release anytime soon, and new images of a functioning sonic screwdriver wiimote peripheral and pending DS stylus only add to American fans' crushing covetousness.As reported by the UK's Official Nintendo Magazine, both the Wii and DS sonic screwdrivers from Blue Ocean Accessories will launch in October, followed by their corresponding games on an as-yet-unspecified winter date. Amazon UK currently lists the wiimote at £35 (about $54 US), with the DS version going for £7.99 ($12.25). 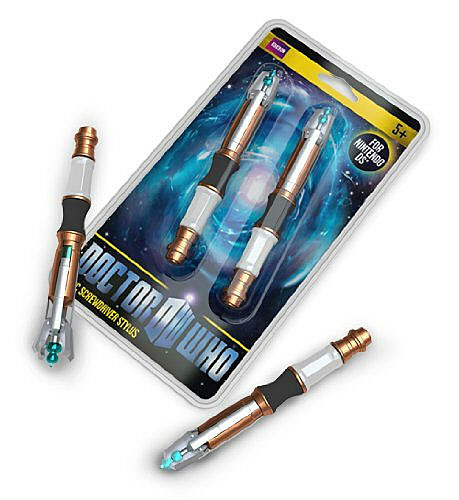 There's also numerous DS zipcases bearing various images from the show, along with a sonic screwdriver stylus floating around for £14.99. Since the two Asylum Entertainment titles seem to tie together, it will be interesting to see if the game maker opts for Wii/DS interconnectivity features. Really, though, I think the sheer novelty of a sonic screwdriver toy that actually affects its "surroundings" in a tangible way is rad in its own right.